← 115. Crisco–It’s Digestible, Y’all! Sounds fantastic! I’ve never made them before but have been wanting to so thanks for the recipe! I currently make green beans with butter, bacon, brown sugar, and a little soy sauce. A similar taste, I think. Love the hand-written note! Sounds my like Grandma writing–one subject to another. It must be a Southern thing! YUM! I make bundles of asparagus in this manner, but I will definitely use this recipe for green beans next time! Oh, how I love your blog!!!!! Yum! And so touching about your Mom. 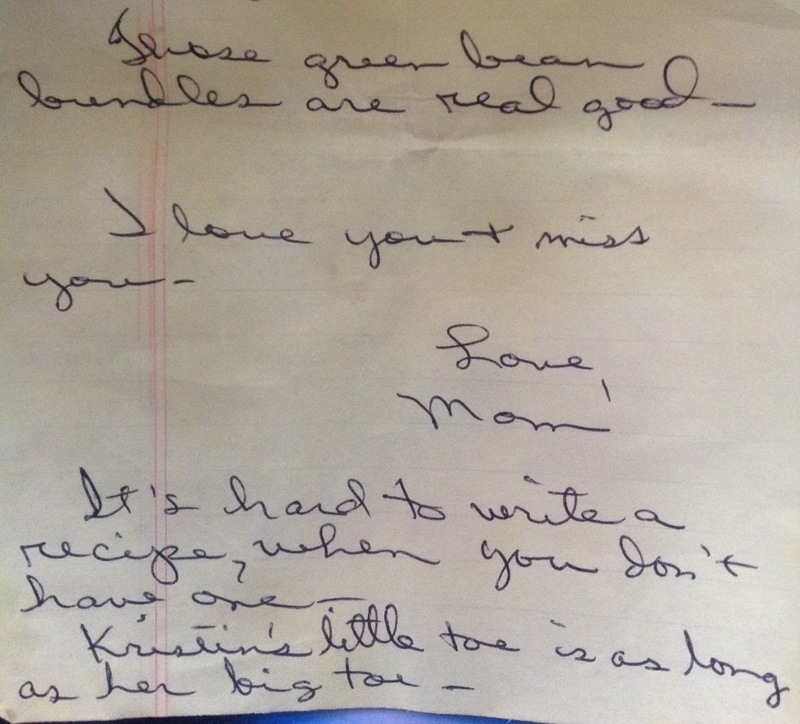 I feel the same way when I see my mother’s notes I’ve tucked away. I LOVE Tyler Florence’s smashed Yukons. Easy, plus you can take out any frustrations what with the smashing n’ such. As to my favorite Thanksgiving dish, cornbread dressing. We don’t mention the work “stuffing” in my part of the south. 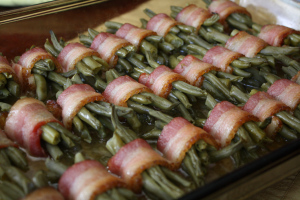 PS – In case anyone was wondering it was not ME who made the “Healthy Version” of Green Bean Bundles…it was my Mother-in-law…I will neglect to say more about them as you should not speak ill of the dead. I have to tell you I’ve got a gentleman caller coming over tomorrow night for dinner… It’s his birthday! Guess what I’m making for one of the sides? Yes! Your green bean bundles! With all the sugar, butter and bacon. I like this one. You can tell how much I like a man by the amount of butter I use when I’m cookin’. 😉 ha! Love it! Hope he enjoys them, but if he doesn’t, you might want to toss him back. Just saying. Oh, what the Hell am I talking about? My boyfriend’s a vegetarian. More green bean bundles for me! Well… It’s safe to say he’s in love now. So, thank you for the *amazing* recipe! Haha! He’s a wee bit older and told me they were better than his mama’s. We all know Southern men don’t ever hardly say such a thing. HUGE deal! 😉 He took the leftovers home even…. There were three bundles left. Two people. He’s a fan. That’s awesome, Tiffany! Better than his mama’s? WOW!! Love that he took the leftovers home (and that there were only 3 left! ).